You’ll always remember your first; that first kiss, your first love, and even your first heartbreak. As for me, I won’t ever forget that first ever snowflake that fell on my face when I was in Seoul, South Korea last year. It was my first ever solo trip abroad and first winter trip; a fulfilled dream because of AirAsia’s promo fare to the Land of Kimchi. Imagine, a public school teacher with meager means to support herself managed to achieve this! And yes, you can do too! 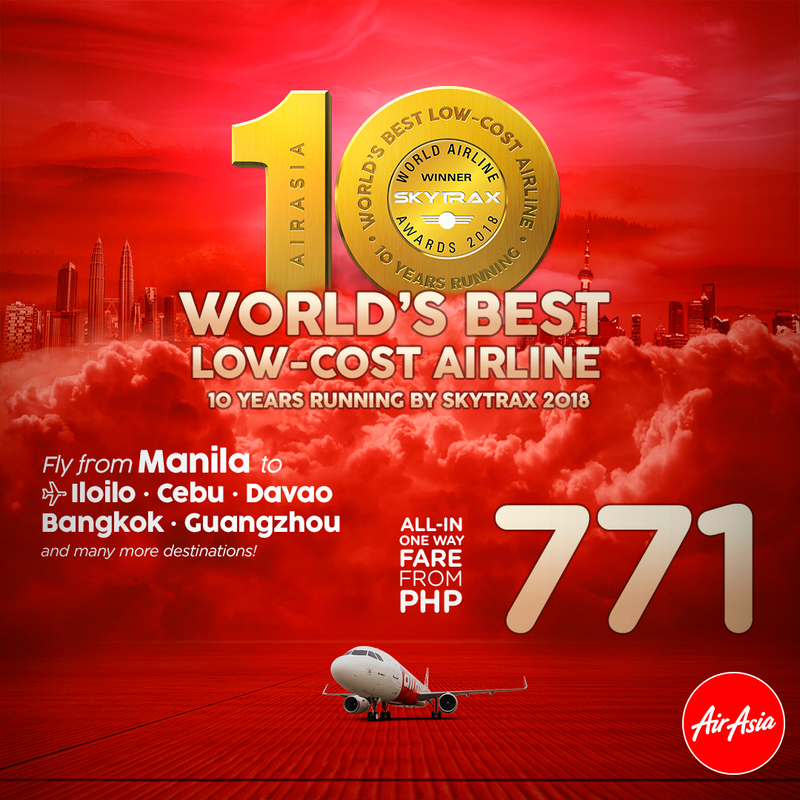 And just days ago, AirAsia just won as the World's Best Low-Cost Airline for ten years in a row. And they have good news for everyone. My all-time favorite low-cost airline just won in the 2018 Skytrax World Airline Awards as the World’s Best Low-Cost Airline for the tenth time. And that’s a back-to-back-back (insert nth time) win. And not just that, to top it all, AirAsia also won as Asia’s Best Low-Cost Airline. I felt proud as I watched the awarding ceremonies at London because a neighboring Southeast Asian country just bagged the most coveted award. And why not? Just true to their tagline, Now Everyone Can Fly, AirAsia really wants everyone to reach for their travel dreams and more. My buddy and I are privileged to go around Southeast Asia and other parts of the world because of AirAsia’s year-round promo fares. Our constant go-to airline when we want the best deal for our summer backpacking trips as you need not to spend all your travel money for airfare so you could save that few bucks on trying the best local food in whatever city you might be in. We traveled to Nepal, Sri Lanka, Maldives, and more because of AirAsia’s seat sales. Amazing, right? Truly, the best deal for your hard-earned moolah. The good news is that AirAsia is currently offering promo fares on flights from Manila to Iloilo, Cebu, Davao, Bangkok, Guangzhou and more destinations. This is part of their celebration as the World’s Best Low-Cost Airline for ten consecutive years. Booking period is from July 23 to 29, 2018 and the travel period is from February 1 to August 13, 2018. For more details, visit www.airasia.com and book your next flight! You can book online tickets at an exciting price, see live flight status and much more at our website. And if you have any queries regarding Spirit Airlines Services do give some time to visit our website, Hopefully you will find the best solutions.